Such a lovely photo of perfect roses in brilliant sunshine. Hope you took a deep breath when you were there! Nice roses, a sign of the season. @Sara Chapman in Seattle, USA -- thank you so much. I LOVE the photos on your site! Gorgeous! @catsynth -- it's a lovely time of year, isn't it? By the way, love the cats on your blog! @Ma.links -- thank you. Your photos are very interesting! I went to school in Montclair...or very close...and have never been there. @And Miles to Go -- they are beautiful aren't they? By the way, I love Robert Frost. @caite -- Avis Campbell Garden is a small treasure found behind the United Way Building on South Fullerton Avenue, right next to the Montclair Public Library. It is open to the public. I believe that it is maintained by The Montclair Garden Club. They have lovely tulips in May and beautiful roses and other flowers in June. Beautiful! I love roses. 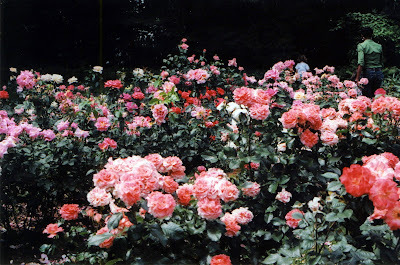 Unfortunately, I haven't found a good rose garden in my new city. But I'm on the look out. @Katherine -- they are lovely. I'm sure there are some rose gardens in your new city.